A stunning cultured pearl necklace featuring certified cultured, freshwater pearls. Supplied in presentation case with certificates. Pearl size 6 x 5.5mm. With a diamond in the clasp. 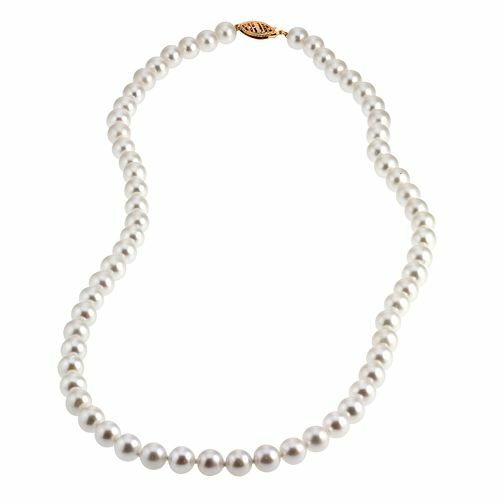 9ct Yellow Gold Certified Cultured Freshwater Pearl Necklace is rated 4.5 out of 5 by 4. Rated 3 out of 5 by Anonymous from Not quite what I expected The necklace is lovely. The pearls are lovely, but not what I expected. In the photo the pearls look round (which is exactly what I wanted to compliment a bracelet I already have), when in fact they are not round at all. They are more bullet shaped. Whist there is nothing wrong with this, they are just not exactly what I was looking for. Rated 5 out of 5 by Anonymous from Lovely Necklace My Wife has always wanted a necklace like this and after I managed to get a set of lovely earrings recently that match this necklace, it was a no brainer. Lovely item.